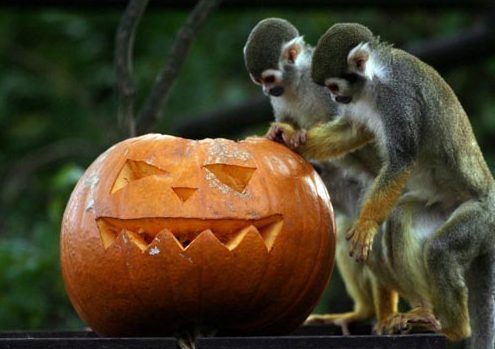 Residents of Detroit Zoo have been given an early Halloween treat this week. As part of the annual "Smashing Pumpkins" event, animals were given pumpkins filled with treats to eat and play with. The zoo's manager says the animals respond in different ways. While one polar bear "bobs" for pumpkins, before tearing them apart, the wolves seemed more interested in treats hidden inside a cardboard pinata. Human visitors also appreciate the novelty. Red pasta hidden inside pumpkins has become a hit with visiting children. Each year around Halloween, the Zoo's animal welfare staff provide pumpkins, gourds and corn stalks as special holiday treats for the animals.